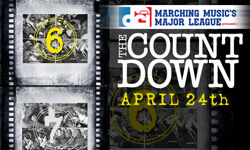 Thousands of drum corps fans have cast ballots to select their six favorite corps performances from 2005-2007 to be shown on the big screen for Drum Corps International's spring cinema event, "The Countdown." With final tabulation complete, Drum Corps International is pleased to announce the performance order for this exciting show, slated to appear in more than 300 select theaters across the country for only one night on Thursday, April 24. Leading the fan-favorite voting pack with a sprint to the finish for this year's "Countdown" was the 2007 Carolina Crown. As a result, the corps will hold the coveted final performance spot during the broadcast. View complete vote tallies for all 35 eligible corps performances. During the theatrical broadcast on Thursday, April 24, fans will act as judges, using special score sheets downloaded from the DCI Web site to rank and rate the performances. Following the in-theater event, audience members will return to DCI.org to submit their scores – the corps receiving the highest marks will be awarded bragging rights as the "2008 Countdown Champion." Returning to the field after more than 20 years, a special exhibition performance by the Anaheim Kingsmen Alumni Corps will serve as an exciting conclusion to "The Countdown." The show will feature a portion of the group's performance at the 2007 DCI World Championship Semifinals in Pasadena, Calif. The Anaheim Kingsmen were Drum Corps International's very first World Champion, taking the title in 1972. Find a "Countdown" theater near you. Purchase $10 tickets to the "The Countdown" through FathomEvents.com.